Needless to say, this past weekend was one of the greatest in the history of weekends. I am not even kidding. It's hard to put into words, because I'm still so in awe of how wonderful everything was. Throughout the weekend, I had to keep reminding myself how incredibly lucky I am. To be surrounded by so many incredible, hilarious, gorgeous, encouraging people. And how I would have never known any of these people if it wasn't for this blog. And really? That's amazing. Completely random, yet amazing. The whole weekend I felt like my heart was going to explode with love. I'm not even kidding. I mean, how did we successfully bring together a group of more than twenty people that met each other online, and not have at least one creepy, awkward, deranged serial killer in the bunch? That may have brought the happiness vibe down a few notches, had that been the case. Seriously. When I was all packed up and ready to leave on Friday, I was just standing at the door, too nervous and excited to leave. All I could think of was, "What if these girls don't like me as much when we meet in person? What if I get nervous? What if I'm awkward? What if we don't get along? What if I drink too much and end up doing something ridiculous like performing Hanson's entire Middle of Nowhere album on Las Vegas Boulevard?" (Actually, in hindsight, that last one isn't a bad idea.) Anyway, as I was standing there, Jay kept telling me to just go. He kept reminding me that I was going to come back on Sunday saying how they were the greatest people ever and that I'd had the most incredible time. That was the kick I needed to get out the door and actually on the road. I knew what he was saying was right. When I arrived (four hours later) and finally made it from the parking lot, to check-in, through the labrynth that is The Luxor's casino, to the awkwardly shaky elevator, to our room that was borderline cave-like, I was more than ready to chug a glass of wine and try to calm my jitters before meeting up with everyone. I gathered my nerves, then headed downstairs to meet up with everyone that had arrived thus far. From that moment on, I knew that I had no reason to be nervous. spending a few hours at the pool each morning. a buffet the first night with (almost!) everyone in attendance. everyone taking a million photos (which is good, because for once, I didn't feel the need to lug my camera around with me everywhere). bonding in the hotel room until 2:30 in the morning the first night - talking about everything and being completely and utterly content. finding the greatest happy hour everrrr, not to mention America's #1 Bathroom. reenacting SNL skits in America's #1 Bathroom (RICK!). having the best roomie ever. hanging out in a fountain - no, really, it was amazing. There were a million little wonderful things that happened, and I would go over every moment in great detail, but I don't think I could possibly find the words! I think that what touched me the most, was the fact that this gathering truly felt more like a reunion than many of us meeting for the first time. It's odd, never having actually spoken with someone or heard their actual voice, but feeling absolutely no reservations when you actually do. Someone mentioned feeling absolutely surrounded with love all weekend, and leaving feeling richer than they'd ever imagined. And that is exactly how I would describe it. I've never been a girl who has a huge group of friends. There have always been just two or three people at each point in my life (aside from my family) who I feel truly close to. That's just how I've always been, and although I'm generally okay with that and realize that much of it is a result of my personality, I've always been a bit envious of people who can count their best friends on both their hands. And I have to admit, that is what I kept thinking about the whole drive home. I realized that all weekend, I was surrounded by people who made me feel so incredibly happy, understood and loved. The whole time I was in Vegas, everywhere I turned was someone else that I just couldn't wait to talk to, to laugh with, to hug. Everywhere I turned, there was another group of people who, although we are different in our own ways, are very much the same. We get each other. And I feel like I left counting my best friends on both my hands - and then some. So, thank you for helping me be that girl. It means the world to me. Why? Because, obviously, that's what bloggers in Las Vegas do. Amen. Awww! This was so incredibly sweet. It sounds like you had a fantastic time. I've already told Nicole, next year? COUNT ME IN. (NO MATTER WHAT). I was seriously so thrilled to get to meet you. I vaguely remember us telling each other how much we loved each other and were sad we didnt get to spend as much time together. Next time that will be different because there will totally be a net time! i miss you already. all of these recaps are honestly making me teary. this weekend was a dream come true and i was oh so sad when it all came to an end. meeting you, hanging out, sharing 15 pound margaritas or whatever the heck was in that drink, staying up and chatting, getting called ugly, jumping in a fountain... i'm convinced we were meant to be BFFs. the only thing that would have made it better would have been a "middle of nowhere" dance party. here's to many more amazing weekends. miss your face already. Ooooh I wish I could've been there! I'm so glad there were no deranged serial killers! I loved reading this and seeing the pictures that have been popping up on others blogs. The amazingness (thats a word right?) of the blogging community astounds me. I'm with Brandy, I HAVE to come to the next blogger meet up! :) I am glad your weekend was everything a shenanigan should be! I'm a wee bit jealous that you might have expressed my feelings a little better than I did. But whatever, because YOU GET ME. Also, I am very teary this evening and I kind of wish you all were here to cry with me. I can't wait to see you again! Seriously, I was so amped to meet you because your blog is so uplifting and I knew you'd be just like that in real life. And you are. Sincere and uplifting and beautiful inside and out. Now I'm so excited that I feel like I can really call you "my friend, Kerri," and not "my Internet Friend, Kerri." What a wonderful feeling. I couldn't have said it better! I couldn't believe how *easy* this weekend was. There was never any awkward conversations or moments, just magic and fun and wonderfullness. I'm SO glad I'm in California now so I (hopefully) don't have to wait too long to see you again! Oh and of course, "I don't wanna go RIICCKKK!" This post made me all warm and fuzzy -and to see you all smiling!! What a great weekend!! It's true for me as well -some people in blog land get me more than anyone else. I'm also one with a few good friends (and one less recently.. see my blog for details). I'm glad you found them to be so lovely in real life as well. I think I might cry of jealously if I keep reading/seeing this vegas stuff! I have to be honest, I stopped reading after you said reenacting the RICK! skit from SNL because THAT IS MY FAVORITE SKIT EVER. No one else ever thinks it's funny but omg, it is freakin hilarious! Anyway, it sounds like you had an amazing weekend! Color me jealous! I love this post, and I love that most of the other posts I've read all exhude this intense thankfulness/joyfulness that a) this weekend was a HUGE success, and the b) this is not the last meeting like no freaking way because we all get along too well not to have a family reunion as often as possible. btw, my entire Sunday evening consisted of my husband and I calling each other Rick, which makes me even more happy because he totally gets how I can love you all just by how happy I was when I came home. I'm going to try to ride this "love high" until I can see you all again. This sounded absolutely amazing! I'm so glad you had so much fun and may be a little jealous! Ha! The blogging community has become so important to me, it's definitely something hard to explain to anyone outside of the blogosphere. I hate that I missed this. Seriously? I just teared up reading this post and all of the other posts and comments about this trip. I am so envious, it's killing me. We WILL be there next year. Can we share a room!? I'm so glad you had such a wonderful time! I'm totally like you with only very few friends that I am close to...and I would love to have this chance like you got to meet up with a group of people who seem to really get you. Lucky girl you are! I'm so glad that everyone had such a great time! Next year, I want to be there. I am SO THERE next year, and it must be as incredible as this year...or more so! This sums up my feelings on the trip exactly, it was like being saturated in love all weekend. I've also never been one of those girls with a big circle of friends, and getting to step into that for a little time made my heart just swell. I felt lifted up by everyone there, the whole time. It was wonderful to meet you, after I ran into you for the first time in the hall I went into Doni's room and before doing anything else, I shouted "Wishcake knows who I am!!!!!!" and everyone just about died laughing at my excitement. Hey you..I changed my link on my blog so I lost contact with some friends hope to hear back fromyou ...cute story! That is so awesome! I hope one day I get to really meet some of my favorite blog friends as well! It was great to meet you and hopefully I will be able to get to know you better between now and the next meet-up. Everyone has such wonderful things to say about you and even though we didn't talk much I could tell they were right! It looks like you ladies had a fantastic time! I'm a tad jealous. I get what you mean about not having a huge circle of friends. I've always had just a fee people I feel close to. As I get older it's getting to be fewer and fewer people. I'd love to meet up with some of my blog friends because I know we GET each other and know we have the same goals and dreams. That looks like you guys had a great time! I'm so glad :) And, lots of girls who know Hanson's Middle of Nowhere? Perfection. I can definitely appreciate the nerves your were experiencing before you left, but how amazing that so many women from all different walks of life could come together and have an amazing time. Very cool :) Glad you guys had fun! this looks like so much fun! I seriously want to go next time. Can someone include me in all the meetups? I would love it seriously! I love how all of our recaps sound exactly the same. We're all oozing with so much love & adoration of each other. ok "RICK!" is the GREATEST sketch everrrrr! I always thought I was the only one who found those skits hilarious. also? amy poehler's dakota fanning impersonation is pretty hysterical as well. Anyways, back to your vegas recap, I completely understood the fact that you described it as a reunion. I could see it being that way. I'm so sad I missed out but...there is always next year! You must PROMISE me that there will be a next year, okay? Fun! Wish you were coming to BlogHer! ok for real. i am coming next year and we are singing the entire 'middle of nowhere' cd on the strip. we can even make up a dance routinue. no? only in my dreams? ok.
but i do lurve me some hanson. 1. 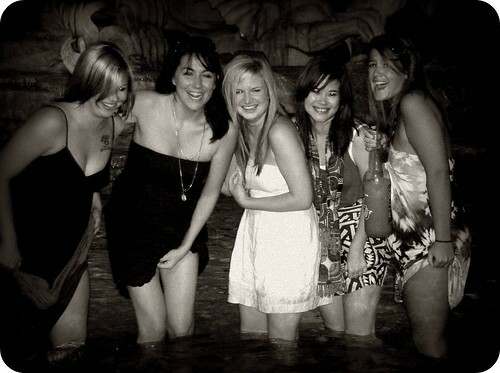 I am quite proud that so many people now have a picture in which I'm in a fountain, REACHING UP MY DRESS on their blogs- haha. 2. I can't even BEGIN to say how much I loved meeting you. 4. I think I should just repeat number 3 over and over again. Looks and sounds like a FUN time! I'm jealous (: and I LOVE Las Vegas! Great pics, as usual! Aww, this looks like so much fun! Next year? I totally want to be there. I'm so glad it was a lovely weekend, and I find it so admirable that all sorts of girls are writing such similar entries. A rarity among girls, particularly so many. Sounds like you had a great time! :) It was so great to meet you this weekend, even if only briefly! I am so jealous (but in a good way) of your wonderful weekend. I'm seriously bummed we didn't get more time together (or even a freaking picture!) but there's always NEXT YEAR!! It honestly sounds like so much fun, so jealous!! I'm so bummed I couldn't make it. I just started connected with people in the 20sb world though, so I think next year I'll have some even stronger connections to meet with. My BIGGEST regret about this trip is still not grabbing you and hugging you to pieces!!! I can't believe we didn't even get to chat. I am still so AMAZED at how every.single.one.of.us were so awesome and loving and caring about one another. I know I was only with the crew one night, but sweet mother, we are awesome! I CAN"T WAIT FOR NEXT YEAR! You + me = gchat date! oh yay! im soo glad you had soo much fun! and the pics are too cute! Ooooh I'm jealous jealous jealous! I SO wish I could have been there! It sounds like it was the most silliest, fun, filled with love and laughter time ever! Oh and I totally love that RICK! skit. Soooo funny! Glad you had an amazing time, babe. I would have LOVED to reenact RICK! HEY RICK!! with you. Next time!